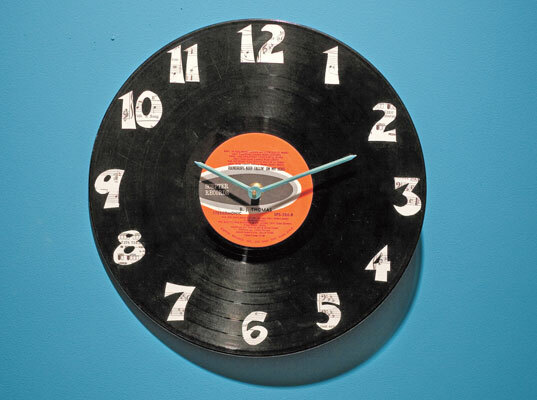 If your daddy-o is a record-lover, he’ll appreciate the nostalgia of this DIY record clock – especially if you make it for him yourself! Recycling and repurposing crafts guru Tiffany Threadgould recently shared the instructions for this nifty Father’s Day gift with us, so see them after the jump or check out her video here. You can use an old LP purchased from a secondhand shop or maybe there’s one in his collection that he wouldn’t mind you using (definitely ask first). 1. Cut out the numbers 1 to 12 from your scrap paper. You can use sheet music, newspaper, magazines, junk mail, or whatever you like. 2. Glue the numbers to the front of your record album. It’s easiest to start with the numbers 3, 6, 9, and 12 at quarter points around the clock to make sure the numbers are evenly spaced. Then, fill in the other numbers around the clock. the center hole. This is tough, so be careful! Widen the hole until the clock mechanism fits through it. 4. 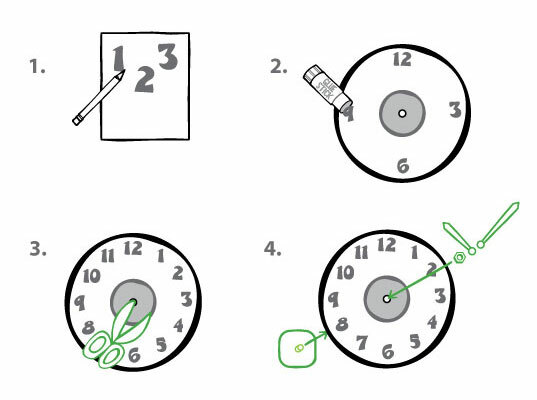 Insert the clock mechanism through the hole in the vinyl record, screw the mechanism into place, add the minute and second hands, and put the battery in place. If you have picture hanging hardware, ask an adult to hang the clock in your room. Or, you can set it on your dresser and lean it against the wall. Now, you’re ready to rock around the clock! To see a helpful video of this DIY, check out Tiffany’s youtube clip here. If your daddy-o is a record-lover, he'll appreciate the nostalgia of this DIY record clock - especially if you make it for him yourself! Recycling and repurposing crafts guru Tiffany Threadgould recently shared the instructions for this nifty Father's Day gift with us, so see them after the jump or check out her video here. You can use an old LP purchased from a secondhand shop or maybe there's one in his collection that he wouldn't mind you using (definitely ask first).